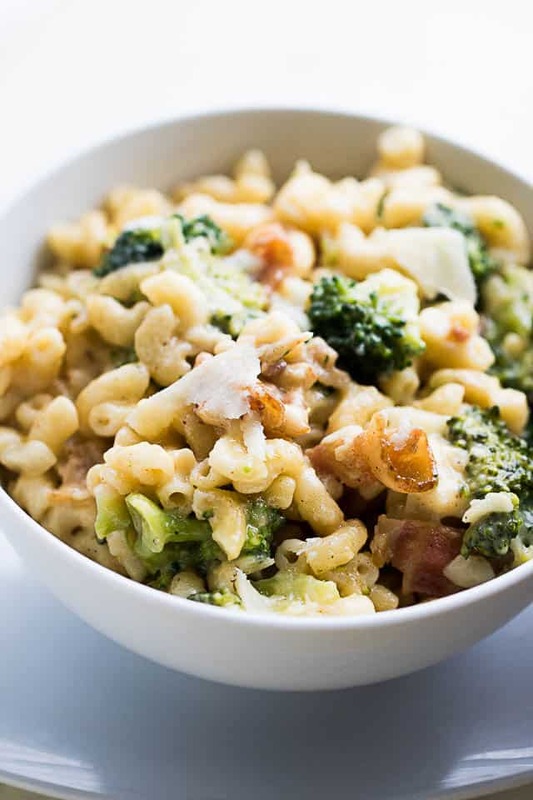 Broccoli Bacon Macaroni and Cheese – Homemade mac ‘n cheese loaded with broccoli, a sprinkle of bacon, and lots of cheesy flavor. Also known as the meal that will get adults AND picky kids to the table. Hi, guys! Welcome to my internet corner – I’m so happy to see you’re here! I’d like to make your stay that much more enjoyable by inviting you to a big pot of mac ‘n cheese that involves bacon + broccoli. 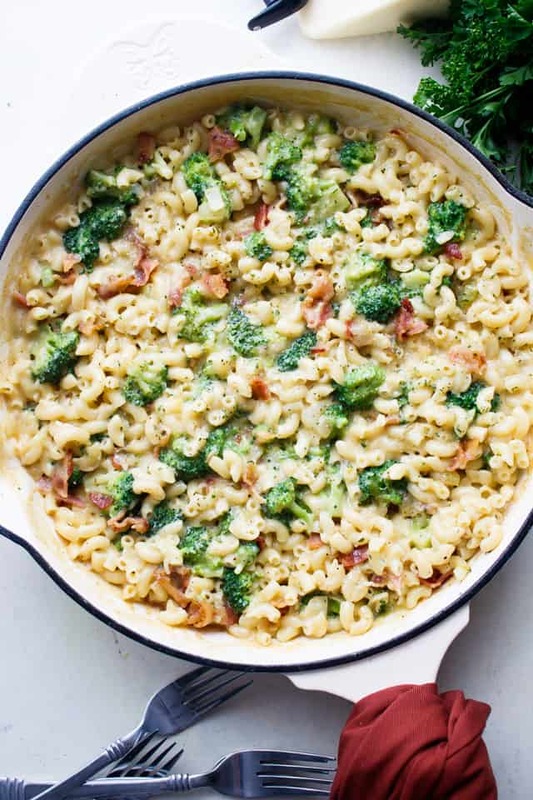 Now that I’ve told you all about my life, and just in case you were looking to consume an obscene amount of broccoli bacon macaroni and cheese… just in case… here we ARE! Can I also make my case as to why homemade macaroni and cheese is a gazillion times better? First and foremost, you know exactly what you’re putting in it. Secondly, you can control the amount of sodium you’re about to eat up – most brands of mac ‘n cheese contain around 900 to 1000 mg per serving! Which is like in 1 cup! Additionally, you can play around with different cheeses – dairy free cheese works really well. You’re also free to use skim milk, whole milk, dairy free milk, all milk! I’m also going to suggest you reach for uncured bacon, which is an easier way of saying that this bacon is a tad bit better because synthetic nitrates or nitrites are not present. Aaaaand don’t forget the broccoli. Broccoli is an excellent source of vitamin K, vitamin C, and dietary fiber. 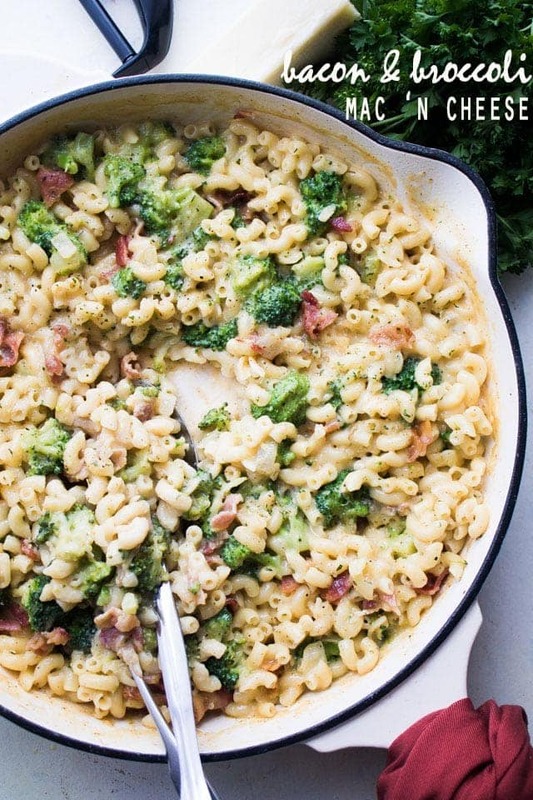 Now, please go place some whole grain elbow macaroni pasta in boiling water and grab a big ol’ saucepan so we can get on this bacon macaroni and cheese deliciousness. 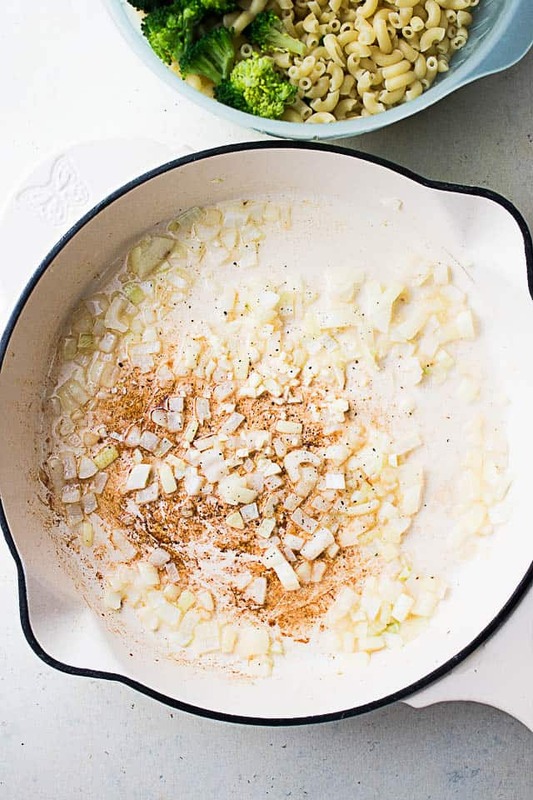 While the pasta is doing its thing, you’re going to sautee some onions and garlic in bacon fat. 🙂 If using turkey bacon, please add a pat or two of butter to the pan. Our next step involves flour, pasta water, and milk + a whole lot of whisking. Then comes the good part – cheeeeese! Add it to the liquid, melt it, throw in the prepared pasta and broccoli, keep stirring, top with bacon, stir, taste-test, serve. Doesn’t that ⬆ ⬆scream dinner?? Sure does to me! 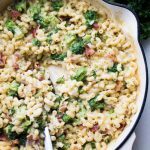 Broccoli Bacon Macaroni and Cheese - Homemade mac 'n cheese loaded with broccoli, a sprinkle of bacon, and lots of cheesy flavor. Add pasta to boiling water and cook according to the directions on the package, adding the broccoli during the last 3 minutes of cooking. Reserve 1 cup of the pasta water and drain the rest. In the meantime, cook the bacon in a large saucepan to a desired crispness; using a slotted spoon, remove the bacon and drain on paper towels. Set aside. Add the diced onions to the pan and cook for 2 minutes; stir in garlic and continue to cook and stir for 1 more minute. Whisk in the flour and mustard; cook for 2 minutes whisking constantly. Pour pasta water and milk into the pan and continue to whisk until mixture is completely smooth and thickened; about 4 minutes. Add the cheeses and continue to cook, whisking, until creamy; about 2 more minutes. Season with chili powder and pepper. 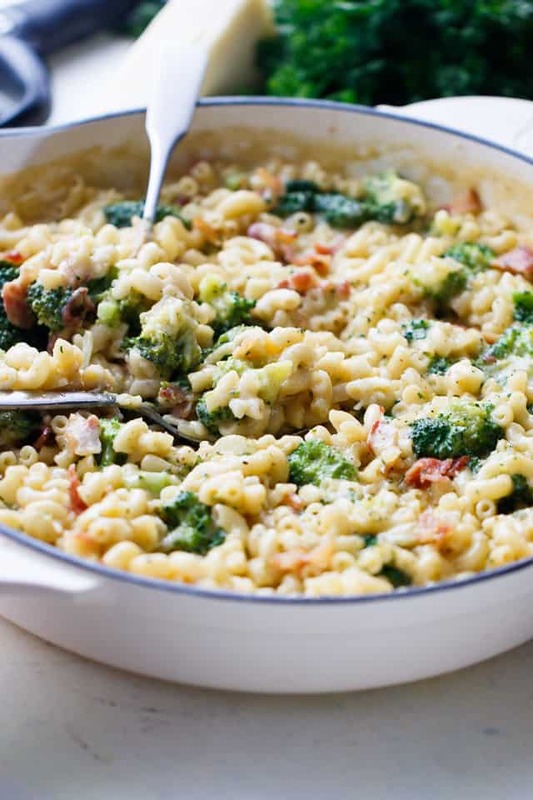 Stir in the pasta and broccoli. What a great combination of flavors! My kids are going to love this recipe! This looks so amazingly delicious! I’ve printed the recipe and put it on the menu this week! Oh my gosh! This is comfort food perfection! I love pasta so much. I am always looking for new ideas. Broccoli and bacon are perfect together. Thanks for the idea! I am loving this kicked up mac and cheese! It will be a huge hit here! Veggies in mac ‘n cheese is totally my jam, and I have no doubt this would be GONE so quickly in my house! Oh yummers! And all on the stove top too. Trying this tonight for sure, thank you! My three favorite things all combined! I love!